New Zealand has a chance to make a real impact in the lives of our children by extending the time parents are supported to spend with their new baby. Although the Government has committed to increasing the entitlement from 14 to 18 weeks by next year, it’s still shy of the six months families need and compares poorly internationally. Australia already offers 18 weeks, the United Kingdom offers 52 weeks, and Sweden offers 16 months. Join us in helping to make sure Sue Moroney’s bill for 26 weeks paid parental leave becomes a reality for Kiwi families. Regardless of work status all families should be given the necessary support to raise healthy and happy children. We need to reject the play-off that the government sets up which pitts working public against those not in paid employment. ALL families need to be supported especially those in low incomes. This campaign should not be seen as bowing down to that type of hegemonic argument that pitts groups against each other. yes this is a interesting one that I did not know about! I am about to take my parental leave and it was my employer (Trade aid) who informed me that I had several weeks annual leave owing and they suggested I take it prior to my parental leave, they explained why! Pity all employers didnt follow their example of fairness! I don’t know if I would call this a ‘bigger issue’?? You’re really lucky if you have a job to go back to, and really lucky that you got paid parental leave. Many women don’t have access to either. I’d just like to say that I believe this is a great thing for parents (currently) and parents to be, or those planning a family of their own in the near future. It’s a great initiative and I don’t see how anyone could turn this down, considering that we spend thousands to millions of dollars on roads (same if I must say, all the time), motorways etc. I think this could work out for both parents as financially it will allow time for both to spend time with their children/newborns. 26 weeks paid leave is an essential community initiative to establish the family after the birth of their baby. The first months/ years are the most informative of a person’s life, to have one person to care, learn and form a loving relationship to is a basic of life . 26 weeks of paid parental leave is a must and the many seen and unseen benefits will pay off long term for our New Zealand community ! That sounds great as it would ensure that babies have more quality time with their parents during such a crucial time. Many parents are unwilling to leave their baby in a childcare facility after three months, so I support this initiative wholeheartedly. Canterbury Breastfeeding Advocacy Service supports this campaign to extend paid parental leave to 26 weeks and hopes that in the future this will grow to up to one year. Recommendations for breastfeeding in New Zealand Aotearoa are to exclusively breastfeed until six months and to continue for at least a year after the introduction of other suitable foods at six months – entering or re-entering the paid workforce before six months contributes to the loss of breastfeeding so without at least 26 weeks of paid parental leave many women are not meeting these recommended goals or their own goals for breastfeeding. We also need family friendly/women friendly/breastfeeding and baby friendly workplaces and early childhood education services so that women who make a decision to return to paid work for whatever reason are also supported. It’s about time! I’d also like to see the fathers being entitled to paid leave at least for a week or 2.
it for ANY parent- including fathers. but you can’t get 26 weeks each, so you have to work out how you want to split the allocation between you both. This is an excellent initiative that needs to be established in NZ, we need to get up with the rest of the OECD! Take a look at the statistics regarding health of babies and children in Sweden and at their exceptionally low rates of child abuse as an example of the goodness that can come from extended paid parental leave. I also believe that this government needs to cease it’s short-sightedness in the matter and look to the future and the long-term benefits that will arise by implementing 26 weeks of paid parental leave. Hannah Shaw, RN (and planning a family). Time New Zealand caught up with the majorityof OECD countries re the length of paid parental leave. Very disappointing that the National Government has said it will use its veto to block this Bill and all New Zealanders need to make them realise an initiative like this which will benefit women, their babies, families and communities should be respected and taken seriously. Hi Jo – you could include this view in a submission on the Bill, to the Government Administration Select Committee. Submissions close on 5 October. I agree with Jo on this. I changed jobs mid pregnancy (before we found out I was pregnant) so lost any entitlement for paid parental leave, yet I have been full time employed and contributing to the NZ economy for the past 5 yrs since I returned to work after my last baby. It stinks! If you ask me the current eligibility rules disadvantage women wanting to make a career move. We should consider period employed rather than time with current employer. I understand it relates to the requirement for the employer to hold the role open but surely there is some other way. Totally! I feel annoyed that I don’t get it when I have worked for the same employer for nearly two years but on a new fixed term contract each semester. Ok, so I don’t have a job to protect, but like you say I’ve been paying my taxes and it’s the government who pays it! As a daily ‘involved’ grandparent…would love to see this submission taken more seriously. As far as I’m concerned, 26 weeks is the absolute minimum – 52 would be better. I’d also like to see a couple of weeks at least of paid leave for the other parent, and greater consideration for self-employed parents – it doesn’t seem that the complexities of those situations are currently taken into account (or not sufficiently, anyway). Fully support 26 weeks paid parental leave. Our children are the future of our country and quality time with parents and newborns is extremely important to a childs growth, values and wellbeing. I fully support 26 weeks paid parental leave, and this is much more in-line with the UK and Europe. The government has an obligation to keep the best interests of their future ‘voters’ in mind, by supporting parents to be able to take the necessary time off work to care and nurture them in the essential early months of life. In Sweden mothers and fathers both receive 1 year of fully paid parental leave, an excellent example for the NZ government to follow. We support 26 weeks paid parental leave, it is fundamental that families have the freedom to choose to stay home and parent, rather than being forced to put babies into childcare to return to work. Parenting is the most important work any family can do, we should give families the financial support to give their babies the best start in life! As a Māori husband, father and grandfather I fully support this petition. In my wife’s and my time of parenting we still had the extended whānau structures around us, providing invaluable support spiritually, emotionally, physically and financially. Parental leave was on the cusp of development so we weren’t fully entitled to what’s being proposed. My wife took her holiday pay and if she returned to work within a six month period she was eligible to claim a parental allowance. I was eligible to apply for short term parental leave from just prior to birth to just after the birth. We virtually flew by the seat of our pants with whānau rallying around with support. I took on extra part-time work to cover our mortgage and expenses and we managed. I do not think Māori of today have the support or the opportunities of old. 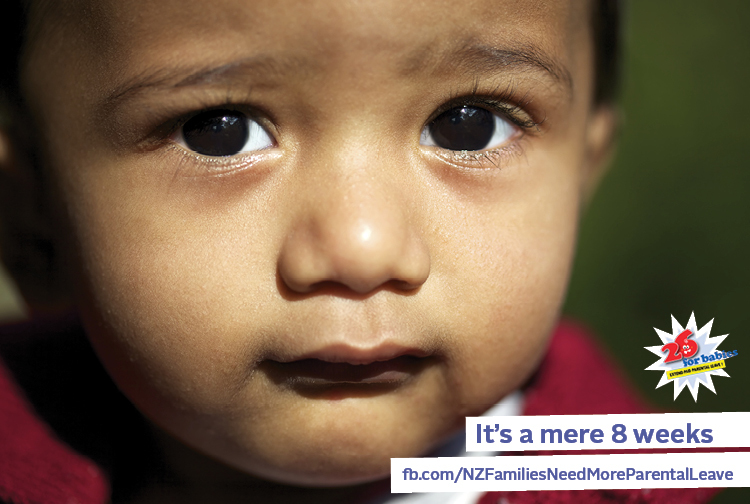 Poverty statistics for Māori are appalling. If we want the “Best start for our children” we must invest in initiatives like what we are advocating for here. There is so much that needs to be done within that timeframe to ensure holistic needs are addressed in order to provide the best start. Absolutely agree Daniel regarding the lack of family support our current generation has. I have been a Social Worker in a leadership role, have no family locally due to us having relocated 10-years ago so my husband could accept a role he was offered. When my husband had to return to work and I was physically exhausted after a month of breastfeeding a baby 2-hourly +/-, in a tired state I racked my brains to think of who I could trust (that wasn’t working during the day!) , to look after my baby while I slept. The only person I could think of was my antenatal group leader. I was humiliated having to ask someone I hardly knew, but she was a Christian so I trusted her. The story didn’t end well for me. It gave me a huge insight though, into the lack of understanding of the need for practical support to Mum’s in the early stages. I agree, the stats for Maori are heartbreaking. You clearly understand the needs of Maori and sound like a true leader. Keep up the great work. This is a fabulous petition, especially recently! The media is focused on the parents that don’t care and hardly ever mention those that do! Surely anyone with a brain in their head will know that more family time is exactly what the children of today need. C’mon guys, get on board! I agree with Gemma – 52 weeks would be better – absolutely – we should battle towards that end. There is no better job parents – a monther in particular does than rear children. They are the future generation – they deserve all the support they can get. Child poverty is not only a lack of food but a lack of parental intimate love and support! I fully support 26 weeks for babies, children need to spend quality time with their parents without having the pressure of returning to work due to financial demands, it is vital for infants to have quality time with thier parents, infants need security, love, and care, becoming parents and have that extra opportunity should be promoted and encouraged. I fully support 26 weeks for paid parental leave, I am currently on parental leave and have had to get a loan to take an extra 10 weeks off. I fully support 26 weeks for paid parental leave and I am happy for my taxes to go to those parents who choose to spend this time with their child. Our children are our future and a strong bond with parents is so important for a sound emotional base and therefore emotionally well adjusted adults. ( I am sure Nigel Latta can provide very strong evidence to support this). For a mother those early months can be overwhelming with sleepless nights and worries about baby, and if she has had a difficult birth a recovery time as well, along with getting breastfeeding (the ideal start to life supported by the World Health Organisation) established. By six months most babies will be having some solids so will probably be sleeping better and breastfeeding and milk supply is established. Mothers will find expressing of milk at work easier. There is so much evidence that shows the first 26 weeks or a babies lives are so important for bonding, for future physical and mental health, lets invest in the future of our country and lets really value our children. I am so pleased to see this initiative to extend parental leave to 26 weeks. We have long known that our aging population requires a growing young population to sustain our society. We have also known that our birthrate was running at 1.9 as opposed to the requisite 2.1 to hold our population stable. It is imperative that our working families produce and nurture families which will go on to work and maintain the wonderful opportunities that NZ has offered us. Increased parental leave encourages working people to work briefly at home raising healthy children, promotes the opportunity to maintain breastfeeding which is a Dept Health initiative and keeps skilled labour returning to the workforce. How can it lose? For all the reasons mentioned. 26 weeks is great. WHO recommends 6 months exclusive breastfeeding. If the Mum can stay at home, this becomes a possibility. This is a NEED not a want for the future generations of this country, to have a chance to be more vital and proactive both in terms of health and financial stability. I am a huge supporter of increasing paid parental leave. We need to align ourselves with other OECD countries and give kiwi children the best possible start in life. Children are all too often overlooked in this country and increasing paid parental leave could go some way toward battling child poverty and abuse issues. Yes it costs money but surely children are worth the expense? I fully support increased paid parental leave in New Zealand. Having been able to see more fortunate nieces and their families in other parts of the world benefit from up to a year of paid leave, it leaves me cold that my own daughters struggle with the stress of work and homelife at this most vulnerable period for their families. Whatever government is in, hear us when we say our kids and mums are the number 1 priority. I have a 23 month-old and can’t think of anything worse than placing her into childcare. She is still breast-fed and will be until she self-settles and self-weans. Research indicates higher levels of cortisol (stress-hormone) in children under 3 in childcare settings in the afternoons compared to those not in care, despite no outward signs of stress. Cortisol impacts negatively on brain development. In the just release issue of The Natural Parent, I see WHO (World Health Organization) suggests the average worldwide age for weaning is actually 4.2 years, which supports my belief that our policies absolutely don’t support the Mother-child relationship. Our Westernized culture has caused us to become unresponsive to babies/toddlers. In the past ou, the rest of us r culture has thought ‘crying-it-out’ is a ‘normal’ way to respond to a baby. It absolutely is not. As Daniel explains indigenous cultures worldwide usually have a family member always at the ready to respond to a baby. It’s Westernization that has forced early independance onto babies. Women’s natural instinct is to respond and we should be supporting that. When we start to look at the emotional problems in our society, I think we need to start at where they originate. Get that right first. Address the needs of those most vulnerable in our society before ourselves – our babies/youth and our elderly! I think we need to learn not to be so selfish. I couldn’t agree more. For the best emotional development of babies and toddlers, they need to be with their mother for, at the very least , the first 3 years and then only gradually eased into a child care centre. if necessary. For those who say that their children have turned out just fine after being in care from an early age, I say that experience is entirely different to outcome. Put yourself in the place of a tiny child with no verbal skills suddenly being left with strangers, as friendly and as kind as they may be, with no understanding of when their mother will return. Sure, they may get used to the situation and adapt over time but that is because they have no choice and it does not mean that it is good for them. The negative impact of cortisol is a very real thing, in adults or children but little ones don’t have the ability to avoid situations that cause it to be released. There is a turning tide against child care, although politicians and various groups may choose to ignore it, for reasons to suit their chosen life-styles. Surely babies deserve the best emotional and physical start in life and that comes being with mother. I am talking about the average loving, caring mothers, not the exceptions who make the headlines. I feel sorry for young parents who find child-rearing so expensive, when they are already struggling financially but babies are a life-style choice, albeit the most wonderful choice of all. Treasure them. I agree, we need to support working families. Extend paid parental leave to 26 weeks. But how about lowering the threshold/age for 20 hrs free childcare down from 3yrs to bridge the gap as well. This is a great opportunity for all parents. i am currently on parental leave and would love to have been able to have 26 weeks paid leave. it is going to be a big struggle for the time i am off once the pay stops. i think it is really important for children to get to spend as long as possible with their parent.i am an early childhood teacher and believe that babies get more out of one-one interactions in the early time of their life! Most countries realise that Paid Parental Leave is about supporting tax paying citizens to remain in the work force, rather than requiring them to leave the workforce entirely. It’s about time NZ politicians realised this too. And I also think it is high time that the income of a single earner is divided in 2, being mum and dad. From a tax rate point of view this can make a huge difference. Yet this is not acknowledged at all. As the mother of a 10 week premature baby I totally support the extension of parental leave. Raising a good human being is one of the most important contributions one can make to society. Part of this is to spend quality time forming secure bonds with a baby. 14 weeks is not long enough. I am. 100% behind this initiative. i am total in support of this i have a 5 1/2 month old boy who is beautiful i was able to get 14 weeks paid leave but beause i am doing this the right way and not ripping off the sytem we are stuggling to do anything beause the govenment thinks that 160 is enough with my partner not earning that much we cant really afford to pay the mortage on the house so means i need to go back to work ahhhhhhhhhhhhhhhh lucky i have a job to go back too but i am have to force my boy on to a bottle now dont get me wrong i have nothing against bottle feeding but i was able to bf and now my stubborn little man is not interested giving parental of 26 weeks means i would have been able to take up to a year which i would have felt betta about. i also feel that building relationships with your parents is important and that the govenment needs to think about the long term and how this is going to help shape our children in a way that the become part of a betta community. I support this whole-heartedly!! I am from Canada where we get 52 weeks, when I lived there I felt confident in starting a family. I was in total disbelief at the thought of three months only!! I literally thought people were having a laugh and it couldn’t possibly be true. how can any mother go back to work after only three months of nursing your baby?!?!?! I’m preparing myself to lose my job when I have children because I couldn’t bear that. Get with it National!! We have one of the worst maternity leave systems . Not only do we have one of the shortest leave periods but also one of the worst paying. I am a teacher and currently on around a third of my pay for 14 weeks, then nothing for the rest of the year which I have elected to take off as I believe my child needs me and not some stranger in daycare. My child needs me to nurse her for at least 6 months , needs one to one for development etc. How can the breast is best be peddled if women are expected to go back to work after just 3 months? NZ’s National goverment needs to show more value for parenting and our young , the repercussions of not doing so are endless. If I was still in the UK working as a teacher, I would receive 3 months full pay and then 3 months half pay after that . As for paternity leave? Shocking that in order for the father to have any paid time it has to be taken from the little that exists for the mother. Something needs to be done, it’s quite honestly , laughable . Totally agree- NZ is totally lagging behind! Why not support mum’s to go back when their babies are ready rather than because of money worries!! I am aware of the importance of being at home with your child. I have been in Early Childhood Education as a qualified teacher for 7years. I am currently at home with my first child who is now almost 11 months. I have just had to quit my job because i cant bare to leave my daughter, especially with a carer or educator. This is the job i want the pleasure of doing. I agree that we should increase paid parental leave to 26 weeks we need to invest in New Zealand’s future our babies are tomorrow’s leaders let’s give them the best start. If i got the chance to have 26 weeks home with my daughter i don’t think i would be in the situation i am now. My 2 yr old has been exposed to day care at such an early age that she has been constantly sick for the last 18 months, regular doctor and hospital visits are the norm. So much time off work, i have no sick leave or annual leave till may next year. Its now Leave without pay, which impacts our family at desperate levels. By giving our babies the best start with mums being home means less pressure on us and the general work environment in the future. Give us the 26 weeks. I fully agree with this initiative. My husband and I are planning on having a family and I would like to know that I can spend the frist 26 weeks giving my child the best possible care without having to worry about where the money is going to come from and how soon I have to return to work. I do my best for this country, surely the country can do it’s best for my child.